Think today's lack of congressional comity is bizarre? It's nothing (or not yet something) compared to the physical violence prevalent on the floor of the House and Senate in the period leading up to the Civil War. Brooks’s assault was an extreme expression of the ‘code of honour’ adhered to in a particularly intense form in the slave South, which permitted, indeed required, violent responses to perceived personal affronts. To be sure, Brooks violated the elaborate unwritten rules of honour in numerous other ways. Honour required a fair fight. It wasn’t honourable to strike an unarmed man without warning, or for a member of the House to do so on the Senate floor. Nonetheless, Brooks, who immediately resigned his seat in Congress, became a Southern hero and was soon re-elected. Dinners were held in his honour, and admirers presented him with golden canes to replace his shattered one. Meanwhile, outrage swept the North. ‘Every blow of the ruffian Brooks gives us ten thousand votes,’ one correspondent from Michigan wrote to Sumner. Seriously injured, Sumner did not return to the Senate for three years, his vacant chair eloquent testimony to the widening gap between the sections. As for Brooks, he died a few months after the assault at the age of 37, suffocating from croup. Anyone with even a passing interest in the Civil War era has heard of the attack on Charles Sumner. But as Joanne Freeman demonstrates in The Field of Blood (the title an allusion to the Senate floor in a letter received by Sumner), it was far from the only violent incident involving members of Congress. Freeman, who teaches history and American studies at Yale, is the author of a well-regarded study of the political culture of the 1790s. In her new book she shifts her attention to the three decades leading up to the Civil War. She reports that not a session passed without punches being exchanged between congressmen, and knives and pistols being drawn. The pervasiveness of violence among lawmakers will surprise even specialists in 19th-century American history. From the mid-1830s to the outbreak of war in 1861, Freeman counts more than seventy violent incidents – duels, fistfights, stabbings – in the halls of Congress and the surrounding streets. Anticipating violence, she writes, congressmen regularly ‘strapped on knives and guns’ before heading to work. Many historians have portrayed the period before the Civil War as a high point of the influence and reputation of Congress. After 1836, the presidency languished as a series of one-term nonentities succeeded the popular hero Andrew Jackson in the White House. Who could become excited by John Tyler, Millard Fillmore or Franklin Pierce? The Senate chamber, by contrast, was inhabited by giants, notably the ‘great triumvirate’ of John C. Calhoun, Henry Clay and Daniel Webster, as well as eloquent spokesmen on both sides of the slavery question, such as Stephen Douglas and William Seward. John Quincy Adams didn’t consider it beneath him to serve in the House after his term as president. Such men offer a sharp contrast to the smaller-than-life mediocrities who occupy seats today. But as Freeman points out, even peaceful congressional proceedings were hardly dignified. Members sat with their feet perched on desks and read newspapers or engaged in loud conversations during debates. They chewed tobacco incessantly and expectorated tobacco juice towards the numerous spittoons that dotted the House and Senate floors. Frequently, they missed, giving the carpets a dark brown hue. The most renowned political figures didn’t take part in violent confrontations, though Clay was a master of verbal threats and insults. He called one colleague ‘a tottering old man’, and when the object of his abuse complained, Clay dared him to do something about it. Fighting was generally left to less prominent men; one dramatic if slightly absurd incident, however, involved Senator Thomas Hart Benton of Missouri, who enjoyed a broad popular following. In 1850, Benton engaged in what Freeman calls a ‘scuffle’ with Senator Henry Foote of Mississippi. After weeks of mutual verbal insults, Foote, a headstrong character who had once assaulted his Mississippi colleague Jefferson Davis in their boarding-house, drew a pistol on the Senate floor. Benton, no stranger to armed combat – he had already killed a man in a duel – theatrically tore open his shirt and exclaimed: ‘I have no pistols! Let him fire! I disdain to carry arms!’ Luckily another senator grabbed Foote’s pistol and locked it in his desk. Less fortunate was the Democratic congressman Jonathan Cilley of Maine, killed in a duel by his colleague William Graves of Kentucky in 1838. As Freeman relates, this confrontation, which no one really wanted to take place, originated with some innocuous comments on the House floor about corruption in the Democratic Party. The insults soon spiralled out of control, leading Graves to challenge Cilley to a duel. Numerous colleagues knew about the duel before it took place, and some tried to negotiate a way out of it. But the code of honour dictated that neither man back down; each believed that not only his own reputation but also that of his party and constituents was at stake. Killed by a bullet that struck his aorta, Cilley received a lavish funeral in the House chamber, attended by the president and cabinet but boycotted by the justices of the Supreme Court. After Cilley’s death, Congress enacted a law outlawing duelling in the nation’s capital, but it had no impact, Freeman writes, on congressional behaviour. Nor did outrage over the assault on Sumner almost twenty years later. In 1858, two years after Brooks’s attack, a violent free-for-all took place on the House floor. It began as a fight between Galusha Grow of Pennsylvania and Laurence Keitt, another aggressive South Carolinian, during a debate over the Buchanan administration’s efforts to admit Kansas to the Union as a slave state. Northern and Southern congressmen rushed to take part. John Potter of Wisconsin grabbed William Barksdale of Mississippi by the hair, only to discover that he was wearing a toupée, which fell to the floor. Some thirty members engaged in the brawl while the Speaker of the House pounded his gavel in vain, demanding order. Given the enormous literature on the Civil War era, it’s difficult for a historian to say something genuinely new, but Freeman has managed to do just that. Why has this history remained virtually unknown? For one thing, the sources historians rely on to study congressional proceedings intentionally downplayed these events. The official record of votes, speeches and debates, the Congressional Globe, studiously avoided mentioning violent incidents. Until the 1850s, newspapers, all of them closely linked to one or another political party and frequently dependent on government printing contracts for survival, said little or nothing about congressional affrays. Only in the 1850s, when ‘a new sensationalistic style of journalism’ emerged, did the press start publishing accounts of these confrontations to boost sales. For good measure, they supplemented their descriptions with mock epic poems and cartoons. For detailed information about what was happening on the House and Senate floors, Freeman relies on the correspondence of members of Congress, whose letters to their families often mentioned incidents of violence, and an 11-volume diary kept by Benjamin Brown French, who arrived in Washington from New Hampshire in 1833 and worked as a clerk in the House of Representatives for more than thirty years. In one way or another, Freeman shows, many constituents were aware of the strife. Some sent their elected representatives knives and guns so that they would not find themselves at a disadvantage. Rather like spectators at modern ice hockey or roller derby contests, visitors to Washington took seats in the congressional galleries hoping to witness brawls. Charles Dickens, who stopped by Congress on his tour of the US in 1842, asked that two notorious bullies be pointed out to him; their reputations were evidently well established. Freeman’s most significant conclusion is that the nature of violent incidents changed dramatically between 1830 and 1860. At first, most altercations took place between members of rival parties, irrespective of geography. By the 1850s, as the sectional crisis deepened, fighting usually pitted Northerners against Southerners. This finding reflects the larger transformation of the party system from a bond of unity in a fractured nation to a source of increased sectional division. In the 1830s and 1840s, the parties were national institutions which brought together political leaders from different regions to work for common goals. They competed on an equal basis throughout the country, and Northern and Southern Whigs and Democrats stood by one another when conflict broke out. By the 1850s, with the demise of the Whigs, the increasingly Southern orientation of the Democrats, and the emergence of the Republicans as a purely Northern organisation, parties realigned along sectional lines. As diverse ideologies related to slavery intruded into the political system, party and sectional loyalties increasingly reinforced one another. Instead of ameliorating the underlying division, the parties now exacerbated it. Representatives from the states on the border between North and South often tried to act as peacemakers, seeking to avert or tamp down violence just as they would during the secession crisis itself. Even before the pre-war decade, however, Southerners were far more likely to resort to violence than their Northern counterparts. Although the most famous duel in American history, in which Aaron Burr killed Alexander Hamilton, took place in New Jersey, duelling soon went out of style in the North. But not in the South. In Notes on the State of Virginia, Thomas Jefferson explored the psychological effect on Southern whites of holding absolute power over other human beings. Slavery, he concluded, unleashed in whites ‘the most boisterous passions’. ‘By definition,’ Freeman adds, ‘a slave regime was violent.’ Southerners were far more likely than Northerners to go about armed. But Freeman also argues that representatives from the slave states deployed violence ‘strategically’, using threats to intimidate Northerners, whom they believed weren’t inclined to fight. Partly because of calculated bullying, she writes, ‘Southerners held sway’ in Congress. After the war, Thaddeus Stevens, the Radical Republican leader from Pennsylvania, regaled younger members with his recollections of the days when Southern extremists made Congress ‘a hell of legislation’. Some Northerners prided themselves on standing up to slaveowners. In the 1840s, Joshua Giddings, an abolitionist who represented Ohio in the House, concluded that too many of his colleagues from the free states were ‘afraid of these Southern bullies’. He resolved to express ‘boldly and fearlessly’ his abhorrence of slavery. Knowing they would outrage Southerners, Giddings presented resolutions in support of slaves who had engaged in a shipboard rebellion. The House censured him, whereupon Giddings resigned and was triumphantly re-elected (his winning margin was 7469 to 393). Northern voters, it seemed, wanted their representatives to show some backbone. As the Republican Party rose to prominence, more members were willing to follow Giddings’s example. ‘The most dramatic innovation in congressional violence,’ Freeman writes, was that in the mid-1850s ‘Northerners fought back.’ Republicans sought to demonstrate that they were a different breed from the milquetoasts of the past. In 1858, three Republican senators even took a vow to stand up to Southern threats and fight ‘to the coffin’ if necessary. Freeman notes that the departure of many Southerners as their states seceded in the winter of 1860-61 seemed to calm things in Congress. Or perhaps slaughter on the battlefield made fistfights in Washington seem petty. Freeman is a meticulous researcher and a vivid writer, and The Field of Blood makes for entertaining reading. But she is not entirely sure how we should explain all this belligerence or gauge its significance. She doesn’t tell us whether these events were unique to the US or if similar ones were transpiring elsewhere. Violence was hardly unusual in antebellum America. These years witnessed riots targeting, among others, abolitionists, immigrants, black people and political opponents. There was all-out warfare in ‘bleeding Kansas’, violent resistance to the Fugitive Slave Act of 1850, and continuing military action against Indians in the West. Hundreds of duels took place to satisfy personal insults. Should the confrontations Freeman describes be understood as instances of the violence in society working its way into Congress? Or was something else going on? When I interviewed Freeman recently at the New York Public Library, she referred to the pre-Civil War decades as ‘a violent age of aggressive manhood’. Congress, of course, was an all-male preserve (the first female member, Jeannette Rankin of Montana, didn’t take her seat until 1917). Women, however, sat in the galleries and their presence, Freeman believes, sometimes encouraged ‘bad behaviour’, as men didn’t wish to show cowardice in front of female onlookers. Freeman discusses at length how ideas of manhood played out in congressional violence. More broadly, Freeman urges historians to pay more attention to the history of the emotions. ‘The fuel that powered the rise of the Republican Party,’ she writes, ‘was emotion: fear of Southern dominance, anger at Northern degradation, horror at the brutal realities of slavery.’ Feelings of shame, fear and humiliation fed into behaviour, including political behaviour. Freeman makes clear that her emphasis on the power of emotions as a ‘shaping influence’ on events isn’t intended to revive the long-discredited view that the Civil War arose from irrational fears and hatreds promoted by irresponsible fanatics, rather than concrete differences of values and interests spawned by the division of the US into slave and free societies. On occasion, however, she seems to suggest that had members of Congress acted in a less bellicose manner the war might have been avoided. 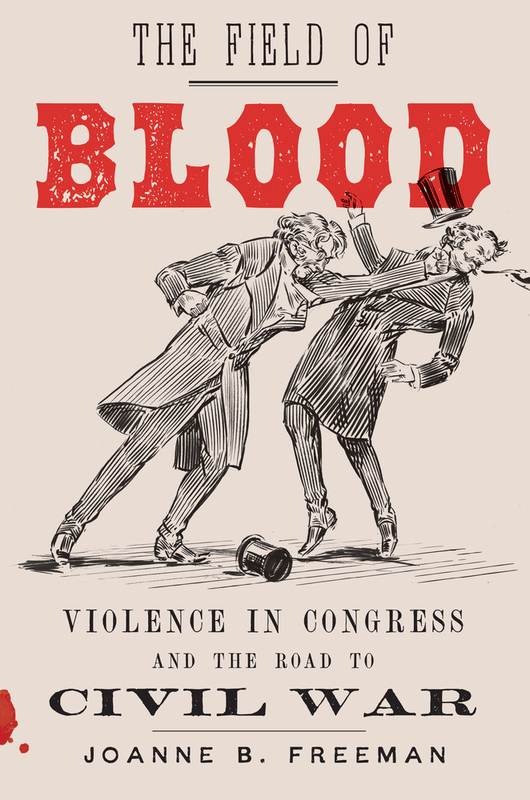 Her subtitle – ‘Violence in Congress and the Road to Civil War’ – implies some kind of causal connection between confrontations in Washington and actual warfare. But it is ambiguous enough to leave open the question of whether the incidents she relates helped to bring on the war or simply reflected a deepening sectional divide arising from other causes. In the end, she opts for the not entirely satisfactory conclusion that congressional violence gave the sectional crisis ‘human form’. At the outset of The Field of Blood, Freeman alludes to our current political polarisation and ‘extreme congressional discord’. Members of Congress no longer engage in physical strife, although verbal assaults are not uncommon. Today, it is he who must not be named who travels the country holding rallies where racial and political hatreds are whipped up and thinly-disguised invitations are issued to take action against ‘enemies of the people’ – the press, Muslims, Democrats, Central American immigrants. In some ways it’s almost reassuring to realise that the decorous debates at the constitutional convention (where, unless James Madison expunged them from his notes, the delegates didn’t engage in fisticuffs) don’t provide a template for all of American political history. The nation survived the moment of bitter division Freeman examines, although it took a civil war to resolve that era’s differences. Despite the many incidents Freeman describes, in the years before the Civil War the House and Senate were functioning institutions. They accomplished far more than they do today, when lawmakers are hard-pressed to keep the government functioning, much less address issues such as climate change and healthcare. Because of the prevailing discord, one magazine in 1860 referred to Congress as ‘the Great National Circus’. More than a century and a half later, the label still fits. Book author Joanne Freeman is professor of history and American studies at Yale University. The author of Affairs of Honor: National Politics in the New Republic and the editor of The Essential Hamilton and Alexander Hamilton: Writings, she is a co-host of the history podcast BackStory. Freeman worked on The Field of Blood during her Cullman Center Fellowship in 2007-2008. For information on subscribing to the London Review of Books, go HERE.